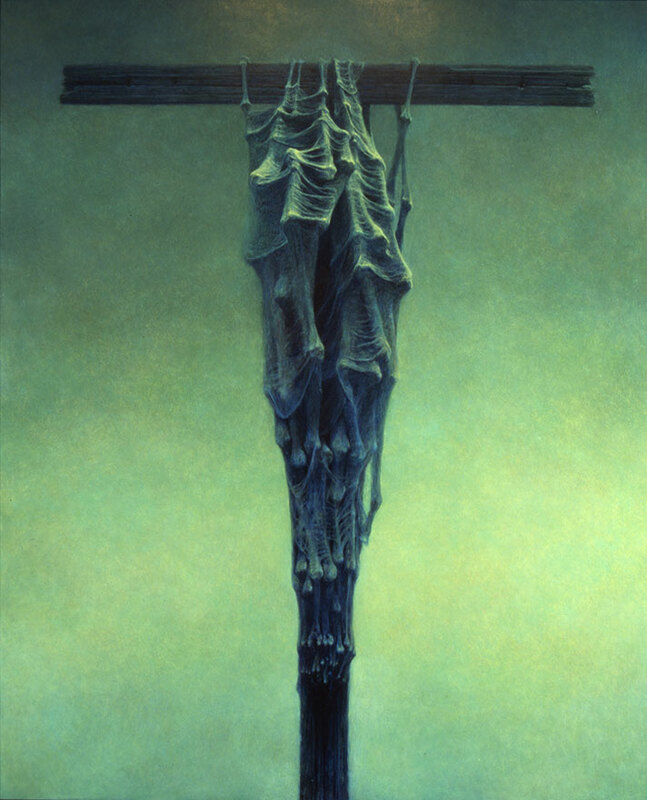 Remarkably, I never heard of Zdzisław Beksiński until a few days ago. It probably doesn’t help that he’s Polish and his full name is impossible to read in English starting with the daunting three letters: Zdz. I’ve probably seen his art before, but thought they were new creations, or lumped them in with what I now think are a legion of imitators, such as one finds on DeviantArt. Discovering Beksiński is like growing up on the second or third wave of derivative prog or metal rock, and then discovering early Genesis or Sabbath, and realizing the style isn’t derivative, but that I’d only really been exposed to the followers. Before you dismiss him as just another of today’s fantasy or sci-fi artists, consider the image below was done in 1969. 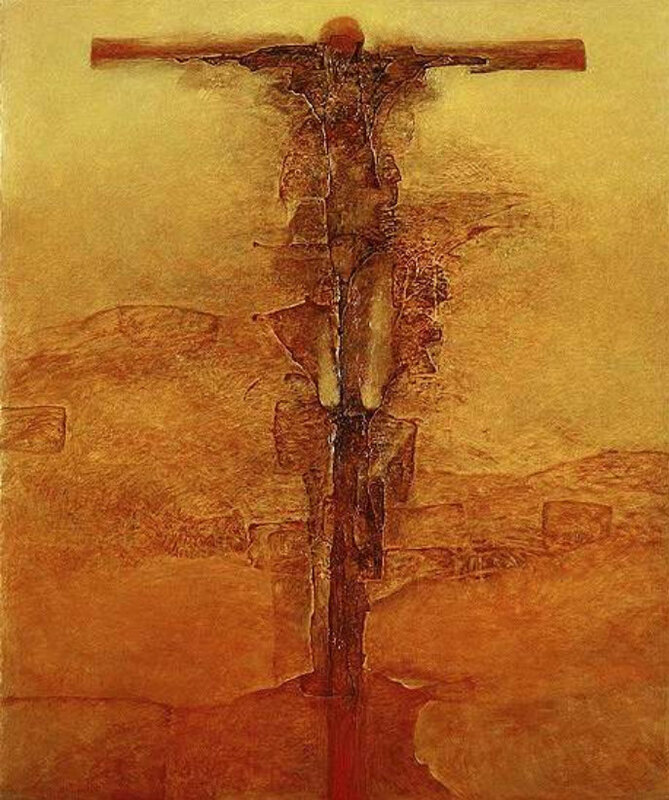 He is the originator, and his work is more than fantasy, as the multiple interpretations of the crucifixion signal the portrayal of an apocalyptic landscape in which cultural paradigms and belief structures have mutated, devolved, or decomposed. 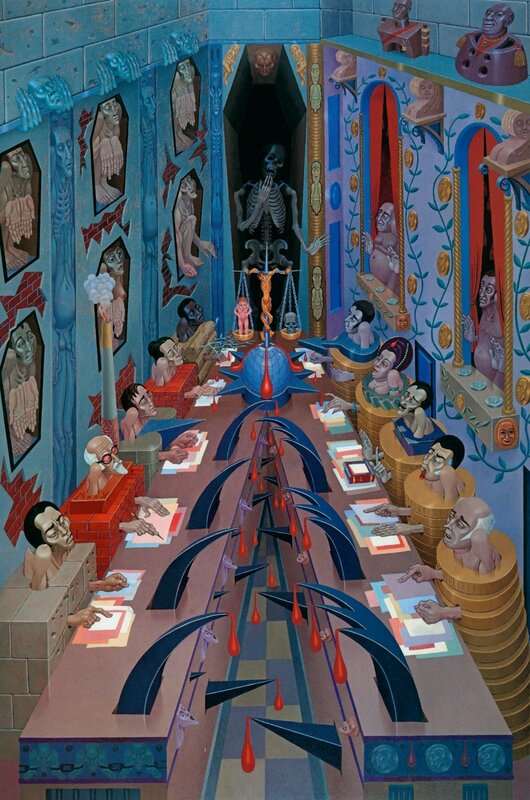 All his works share a dark vision that is more than “horror”, and represents a reflection of the age he lived in. And while some people might try to say that his art was a foreshadowing of his own murder (he was stabbed 17 times by the son of his caretaker, because he wouldn’t loan him money), I don’t really think that’s possible. However, the horror of his death makes it very difficult for his work to be too dark to reflect his own fate, and I’m not 100% sure that time is completely linear, and that the future has no bearing on the past. There’s no doubt that he lived in a world with a dark and dangerous undercurrent, which he successfully depicted. Nothing needs to be said about Beksiński’s paintings because they succeed in terms of purely visual language, which is why he didn’t even bother to title his pieces. One can interpret the subject matter and argue for this or that meaning and significance, but that’s about as useful as writing about why a recipe tastes good instead of eating the food in question. That kind of writing about art, for example, about Jackson Pollock, may help people get over some sort of hurdles that impede them from looking at it openly, but once you understand the background for drip paintings, that rhetorics not going to matter as you look at one painting after another. You should like them non-verbally. And this is an interesting and telling problem with a lot of contemporary art and theory: it is verbal first and visual second or not at all. The placard on the wall declaring its cultural or political significance turns out to be more relevant than the work itself. A context is being sold in which the works are considered important and valuable. 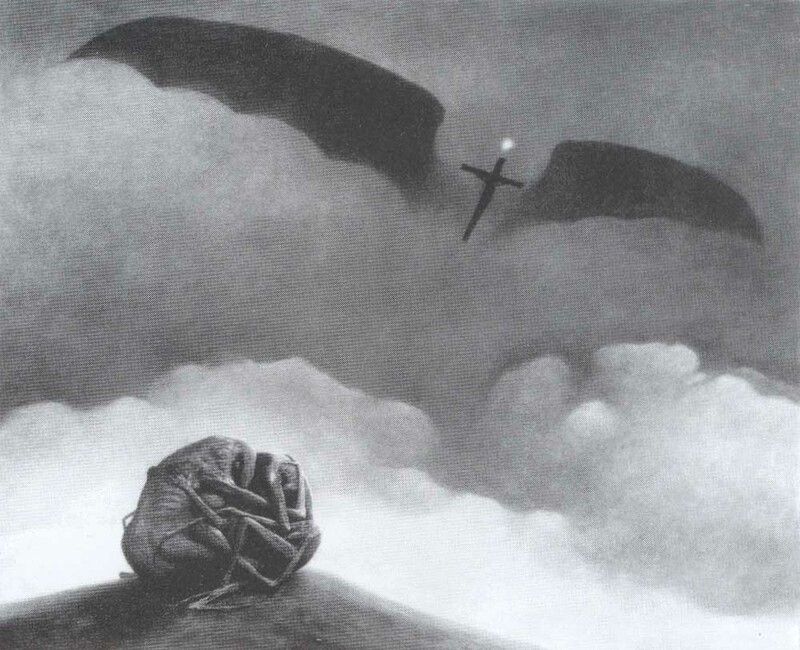 The kind of art that speak visually isn’t a part of that, really, and has been sidelined in favor of more conceptual works, which is why I never heard of Beksiński. 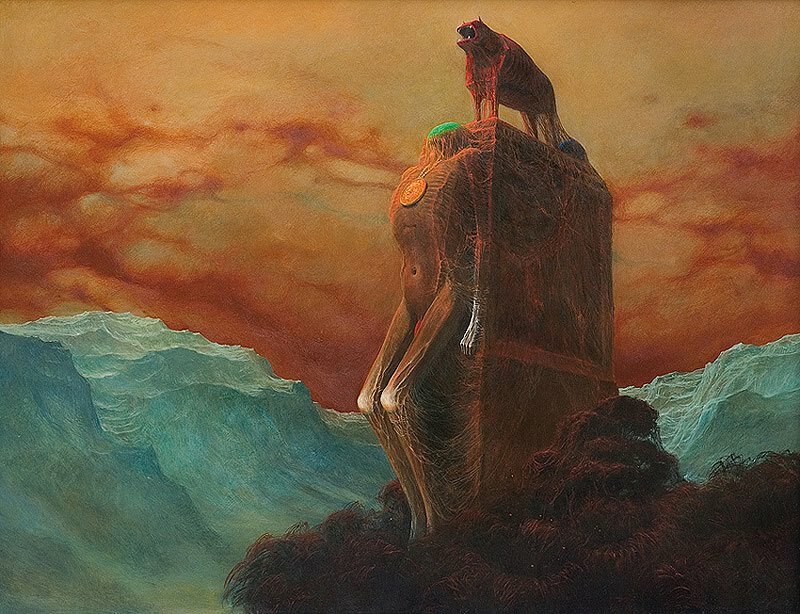 Beksiński is an artist a bit like Alex Grey, H.R. Giger, Roger Dean, or Mati Klarwein. They have wide appeal and sometimes mass popularity, but are never mentioned in a fine art context. 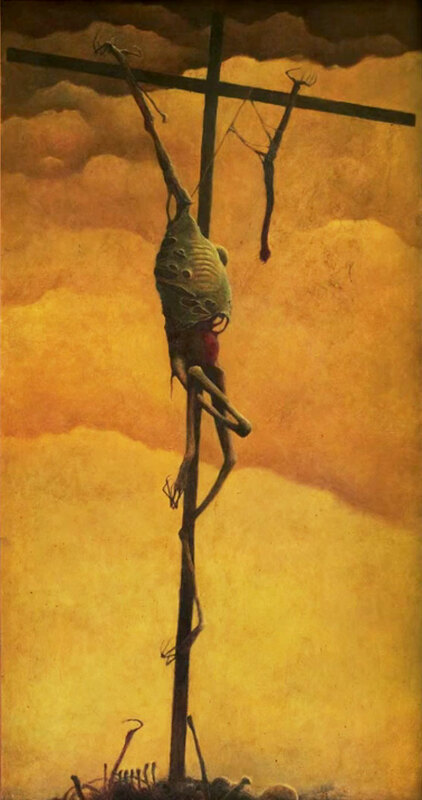 Everyone knows Giger from the Alien movies and perhaps the ELP album cover, but I got a Masters in Fine Art without ever encountering Beksiński, Grey, Dean, or Klarwein (and Giger was never mentioned, unless in utter derision as a white male and thus automatic misogynist). We all knew in art school that these types of artists were anathema, and if you liked any of them you were DOA on the art scene. But not including them is like having a history of 20th century music that doesn’t include any reference to Led Zeppelin, Jethro Tull, or Black Sabbath. I can easily understand why people might focus their attention elsewhere, and feel no compunction to mention more popular music, but the history is incomplete and skewed without their inclusion. I can see why an art teacher would be hesitant to teach students about these artists, because probably a lot of students would immediately start making knock-offs, and the whole trajectory of contemporary art has been to steer young artists away from the temptation of making “visionary” or highly imaginative types of work. They’d want young artists to be exposed to a lot more work and different styles. But to completely omit it? 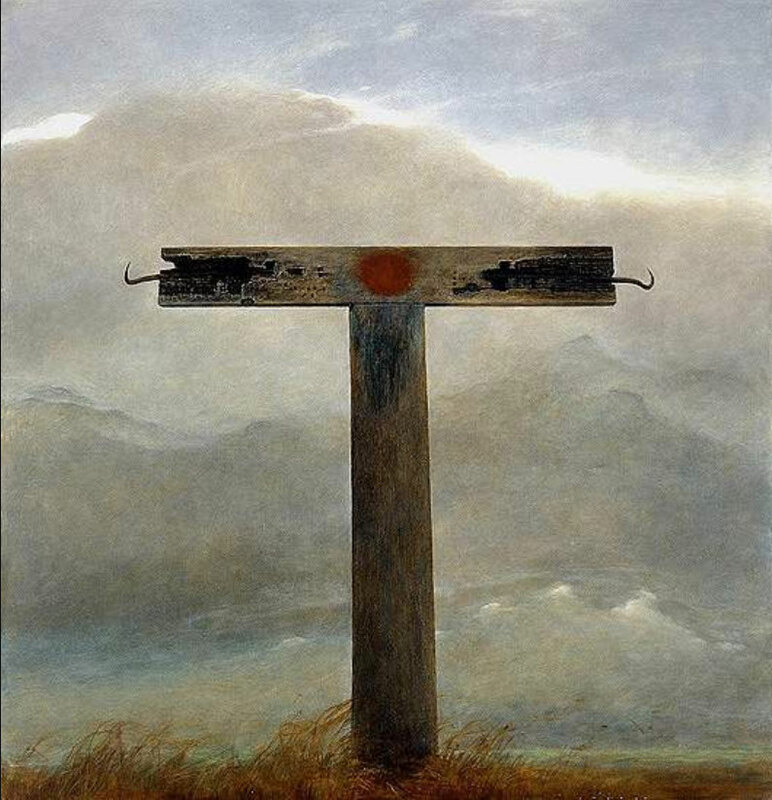 Beksiński was murdered in 2005, but his work looks more contemporary. I’m certain many in the world of fine art dismiss his entire oeuvre with a wave of the hand, while having a gleam in their eye for the highly reflective and vapid appropriations of Koons, or a scowled eyebrow in conviction of the importance of visually uninteresting but politically/polemically challenging pieces (I dare not single anyone out in that category). 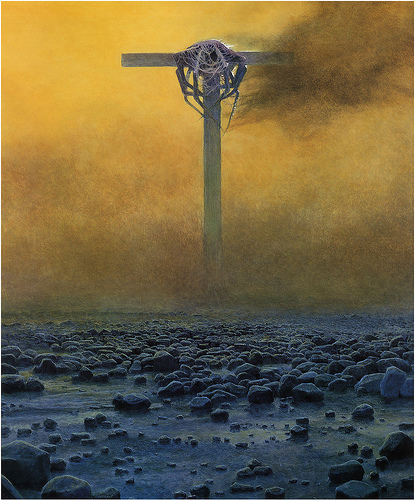 But I think Beksiński is a great artist, whether one likes him or not, and it’s obvious in his multiple interpretations of the crucifixion. To say otherwise is like saying Jimmy Page couldn’t do a good guitar lick. 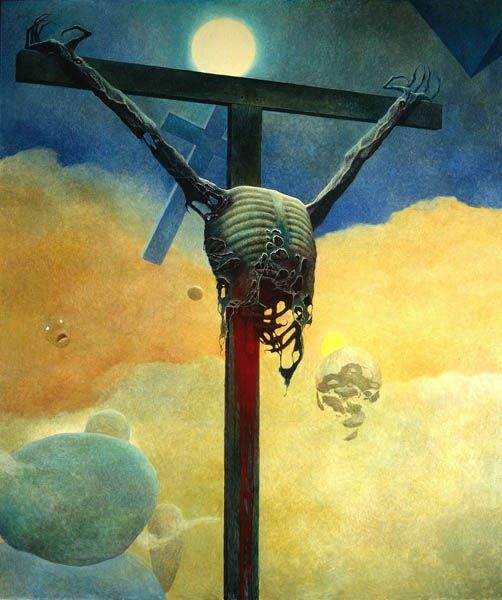 Posted in art criticismTagged art, art criticism, contemporary painting, crucifiction, Expressionism, horror art, sci-fi art, Zdzisław BeksińskiBookmark the permalink. This is a very interesting essay about Beksiński. Congratulations. Thank you. I am translator of documentaries about him. You can visit my youtube channel entirely dedicated to him. Wow! Great work. I just skimmed over this video, and it looks really interesting. Great to see thet artist talking about his struggles in making his creations. I already subscribed to your channel. Thanks for the recommendation. I’ll have to research him and do a write up, er, when I’m done with my analysis of why people hate conceptual art. Funny Fan Art! Horrendous Artistic Anomalies.